3/4 in. 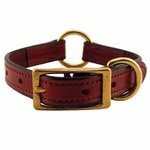 K-9 Komfort Deluxe Leather Center Ring Puppy / Small Breed Collar. $17.95. 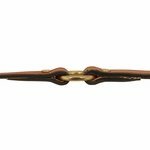 "I did not expect such great quality for such an affordable price. I will be coming back for many more collars and recommending Gun Dog Supply to anyone who asks." My Doberman is only 10 months old and 50 lbs. This collar fits her great and looks amazing. I get compliments every time I take her out. I did not expect such great quality for such an affordable price. I will be coming back for many more collars and recommending Gun Dog Supply to anyone who asks. Also, thank you for shipping the same day I ordered. That's customer service! "This was the best collar I found, and it is fantastic." This is truly not what you think of as a gun dog, although he has a sincere hatred of squirrels and has killed two moles. I was going to send you a picture of our dog with his collar because he is so not a hunting dog. This was the best collar I found, and it is fantastic. The ring at back is great for attaching the leash. 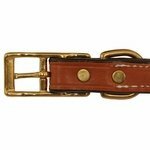 This has the same quality as my $300 bridles for my horse - perhaps you should expand into strap goods for field trial horses. High quality. Can't find a better leather collar anywhere, especially for the price. Great collars! I have them for both of my bigger dogs. They are sturdy and attractive. I get lots of compliments on them. Looks like they will last for years and years. Definitely recommend, and would buy again! These are my favorite collars. They fit nicely, and don't damage.the haircuts. Great collar. Appears to be really tough, but great looking. The quality is excellent for the price. Looks great and is highly functional. It is always a struggle to find nice collars that are affordable and durable, but not so wide that they irritate my dogs' necks. The 2 collars that I purchased have the ring on top which makes it easier to put on the leash. Very happy with these collars, and they look great and are of very good craftsmanship. Wish I knew about these collars before I purchased other pet store and catalogue collars. Absolutely beautiful construction. 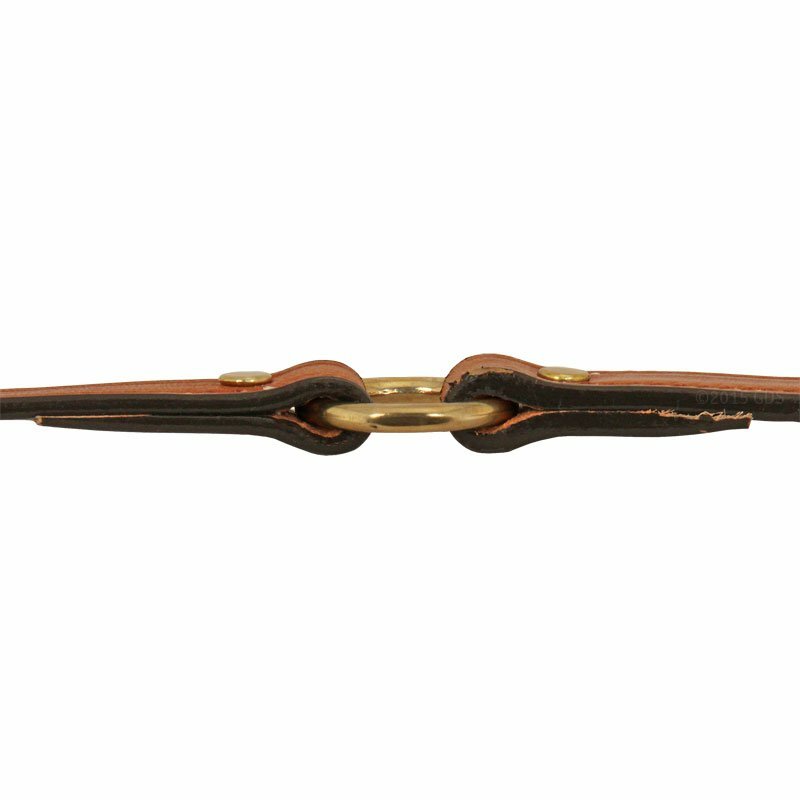 Durable, and the brass hardware makes this one stand out. The best dog collar we've ever bought. 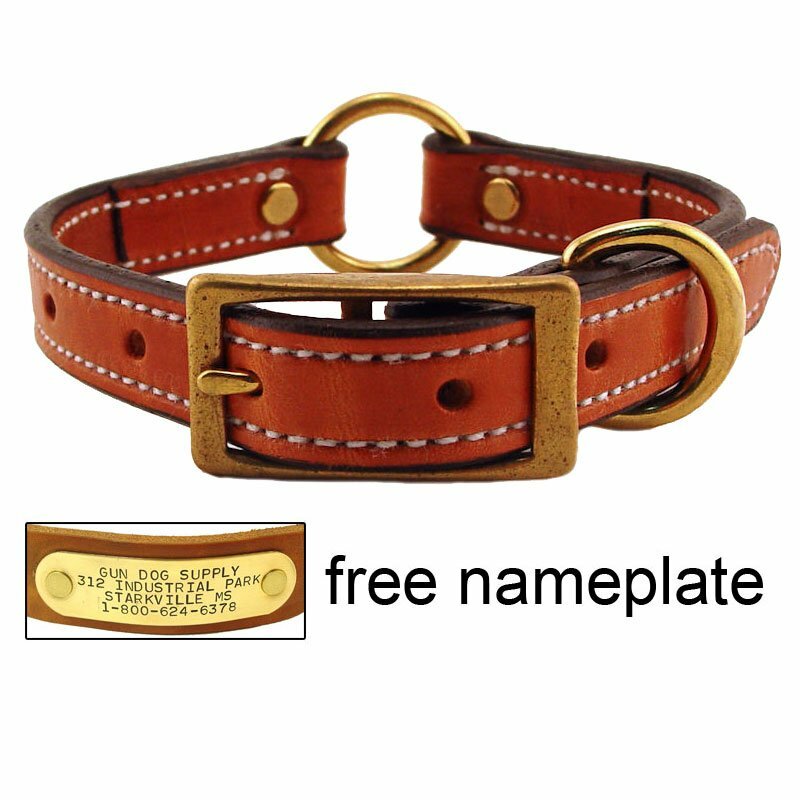 Beautiful personalized collar and fast service. I have paid double this price on another website before I found Gun Dog Supply. I can send a picture of my happy dog with her new collar if you like. This is a perfect fit for my female Dobe. I didn't want anything bulky. It's well made, and I don't have to hear her tag jingle every time she walks or scratches. Thanks for a great product. Great product, looks and feels solid and seems like it will last just as long the one we bought from here before. Shipped very quickly even with the name tag. Well made, quick delivery, looks good, and works well. High quality, Brass name tag could be smaller. Very good quality. Would order again. Professional service, arrived in few days! Excellent! The collar looks and feels great. The leather is thick and the brass name plate eliminates that jingling from the typical dog tags. The only downside is that I've had to use a hair tie to secure the tail end of the collar so it's not sticking out and getting in the way. Overall, I love this collar and have received many compliments already. 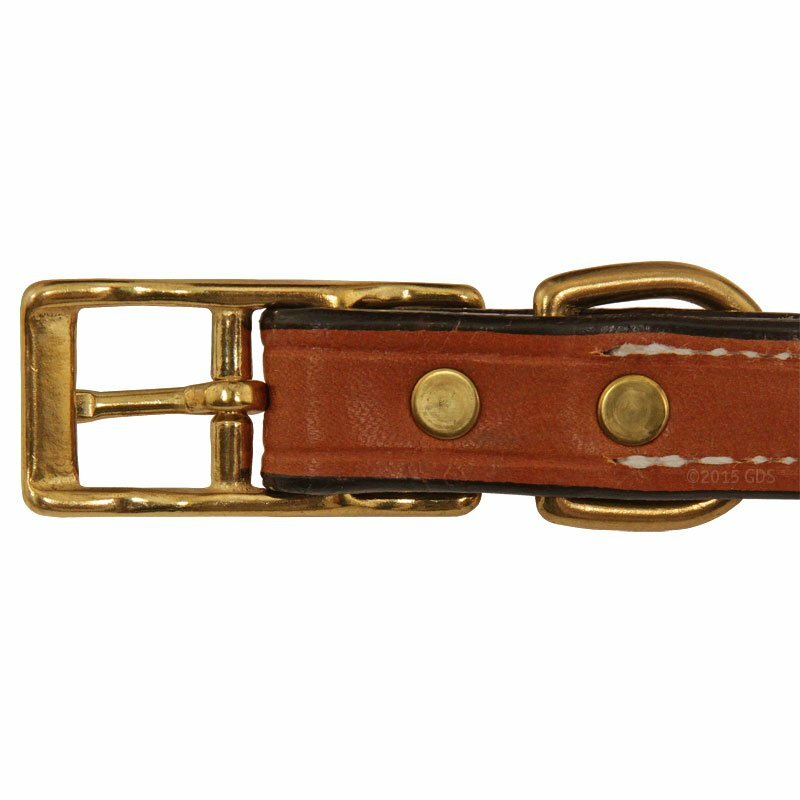 I love these collars, the quality is the best I have ever seen. I love the leather. My dogs like the water and this isn't best for real leather, but I oil it. My opinion is that it is worth the trouble. The collars become part of the dog's body and pay them the respect that they earn. I'll never buy another collar. Thanks for the service and quality. Best collars made, hands down. I have bought 3 so far. The quality can't be beat. I saw a similar one at Cabella's. With shipping, I paid about the same as theirs, however yours had the name tag. This eliminated the dangling name tag I was using. Excellent quality and my wife said it looks good. Gun dog supply couldn't have been more helpful. I needed to change the info on the nameplate on the collar that I ordered, and they handled it immediately. I highly recommend gun dog supply. This is an excellent collar and well made. We are very pleased with the collar and the craftsmanship. It fits my 65 pound dog beautifully. It is not too wide nor too narrow. I have had many compliments on this collar. I highly recommend it! Beautiful, sturdy collar! I highly recommend! 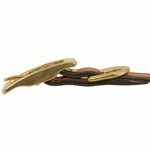 Good quality buckles on nice leather. Durable and good looking. We like the leash ring on top. Easy and quick. "Very durable and the ID plate is a great feature." We have had these for years. Very durable and the ID plate is a great feature. Will be ordering two more for the puppies. I really like that they are Made in the USA! I love this collar. I have 1 on each if my dogs. Theyre sturdy and very aesthetically pleasing. Engraving is easy to read and holds up strong. Will buy again! "This collar is top quality." This collar is top quality. 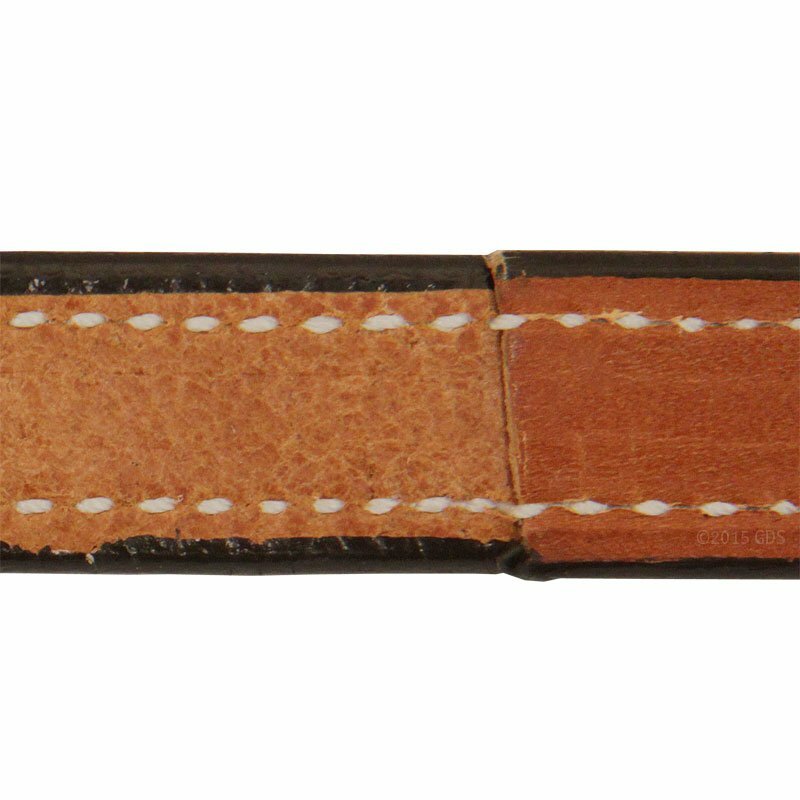 It is well made from good leather. It fits well and looks great aginst his dark coat. 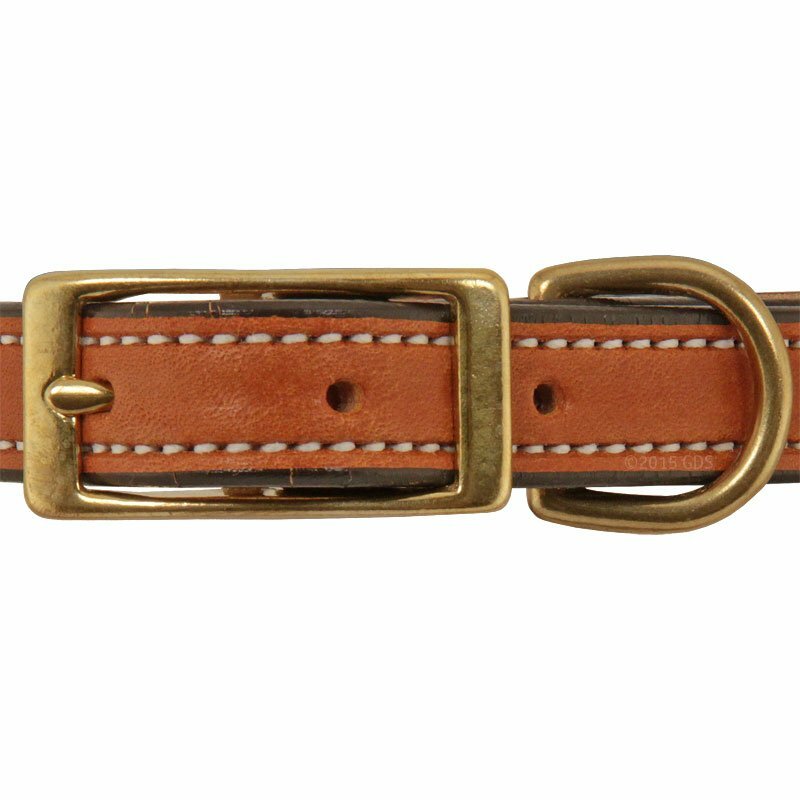 I also like the engraved brass name plate that is riveted to the leather, I don't have to keep the jangly tags on him. All arounf around great product. I would recomend it to any dog owner. Great quality, classy look and made in the USA. Great quality! Looks beautiful on her, lots of compliments. Everything is sturdy and well made. Cleans up nice. She is 7 months old, so I bought a little longer so she can grow into it. Love it! Tip from an awesome hunting trainer: on the nameplate: put phone numbers, reward, and needs medication. Because nobody wants a sick dog. And everyone wants a reward ;). We also put our microchip brand. Great collar! Great service!! Thank you. We got this collar for our Boxer puppy. He's 5 months old. We LOVE IT. It is made well. It's good looking, and the ID tag is wonderful. He gets compliments on it all the time & I tell everyone to head to the Gun Dog Supply website! Even though he's not a hunting dog, I will definitely be purchasing the next size up when his neck gets bigger. Highly recommended. I misunderstood how to measure the neck which resulted in accidentally ordering a size too big, but other than that I love it! It's really a nice, well made collar. It's easier to clip on her leash to the ring on top and also, it's safer because I can't accidentally clip her leash to her tags. When we walk, the leash clip is out of her way too. I LOVE these collars! Exceptionally made and extremely rugged. 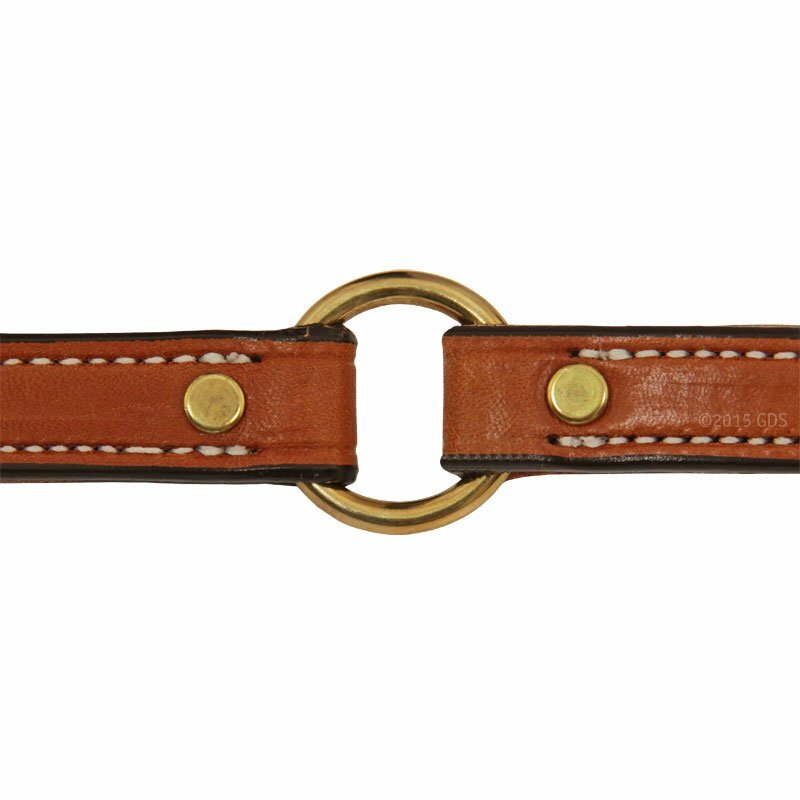 I love the ease of the center ring for clipping/unclipping the leashes. The free name plate was a nice bonus. I will never buy my dog collars from a local pet store again. A little big, but he will grow into it. Excellent quality, and I'm reordering a smaller puppy collar. Your customer service is above, way above what I've experienced with any product. The collar looks classy and will certainly serve us for many years. Best collars available. A ll three of my dogs have one. Collar looks great! Good quality, as always. Arrived very quickly also! My only (very slight) issue with this collar is that the nameplate is almost the exact same size as the width of the collar. Looks a little odd, but no big deal. Would have preferred a nameplate that is slightly smaller in width as compared to collar. 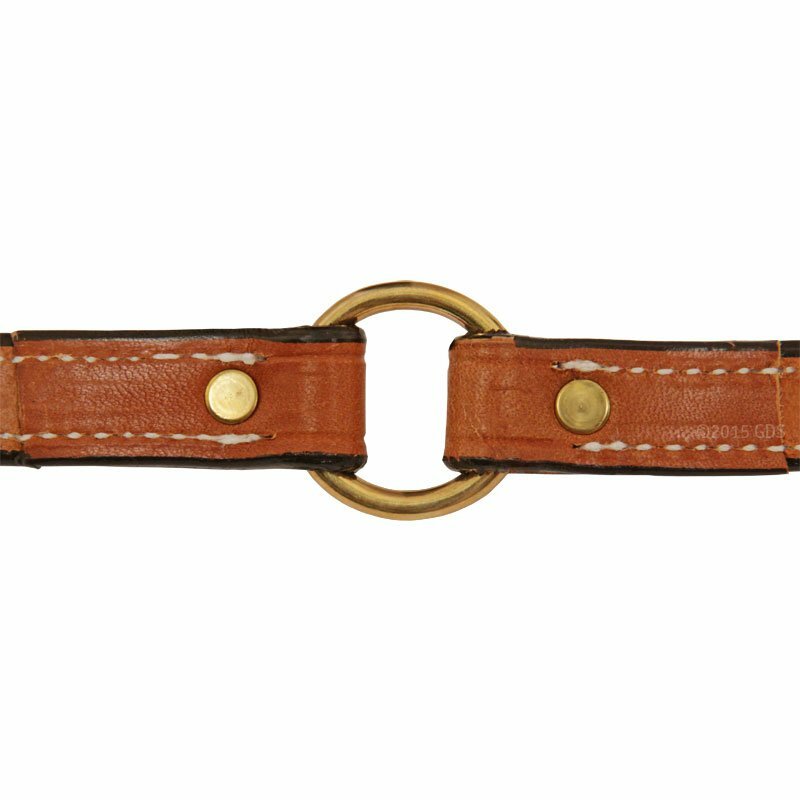 The 1 inch collar is perfect, but my new pup is a petite girl, so this width suits her better. 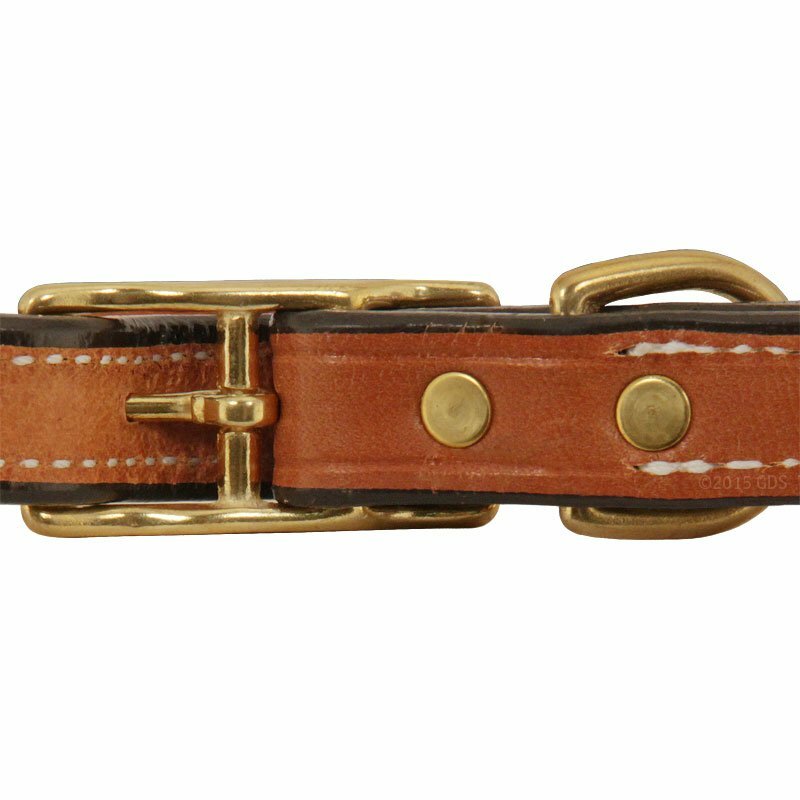 This is a great collar for price. The leather is nice and thicker than anticipated. The engraving is easy to read. It breaks in pretty quickly. Before the first use my husband gently bent the metal engraved tag a bit to form to his neck a little better. It looks great! "The service here is great and quick. Good quality products!" I had a rivet that came off of one of the collars that I ordered only a few days after use. I was promptly sent a 6 pack of rivets, so I could put a new one in. The service here is great and quick. Good quality products! 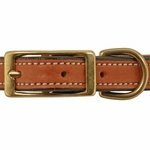 "Great quality and my dog loves it!" Great quality and my dog loves it! Tashi's first collar lasted thru 5 years of swimming, racing in woods, and urban leash walking, so we decided to replace it with same great product. Although she is no longer a puppy or small breed, 3/4 width is perfect for her thin neck. Leather and brass fittings are fine harness quality. 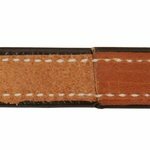 A little saddle soap keeps leather supple. Service was amazingly swift. Good advice, Steve, to avoid owner's and dog's name on brass plate. Thanks bunches! 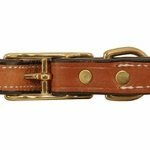 "Dog collar is built very well"
Dog collar is built very well, and I have had several individuals ask where I purchased it from. Good solid collar. Wanted something that would be a little more comfortable but we'll have to wait till this softens up a little. Very happy with it. I love this collar, but the nameplate was placed on the wrong side of the O-ring. It's under the tag end of the collar, and it cannot be seen. 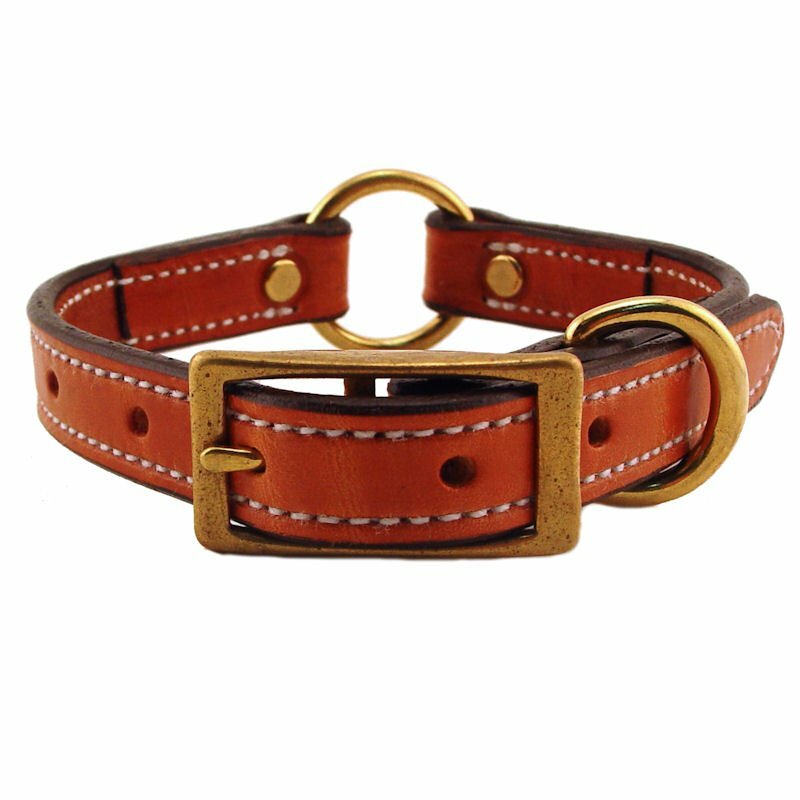 I just got three collars from Gun Dog, so I\'m saying \"neutral\" for now because we haven\'t used them yet. One thing I noticed though is that the ID plate is riveted on the side of the collar where the leather passes through the buckle, so my ID plates are all covered by the end of the strap. It would be better to put the ID plates on the other side of the collar. I\'m a little disappointed that they aren\'t easily seen. Also the \"london tan\" is much more tan than in the pic, not as orange/red, but this does not effect my opinion, as it is hard to perfectly represent a color. Rated 4 stars from 2 user ratings. 3/4 in. K-9 Komfort Deluxe Leather Center Ring Puppy / Small Breed Collar -- 12 in.